Is this how Microsoft coaxes hardware makers to roll out Amazon Echo rivals? 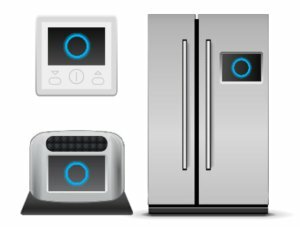 In 2017, your new fridge might be able to tell you corny jokes and serenade you, but still lack a witty answer to “Are you Skynet?” Microsoft announced during the WinHEC coference in Shenzhen, China that Cortana would arrive on Windows IoT Core as part of the Windows 10 Creators Update. The IoT version of Windows is designed for smart devices such as robots, maker projects, thermostats, toasters, doorbells, and picture frames. Windows IoT Core can sometimes lag a little behind Windows 10 PC releases so it’s not clear when the IoT version will roll out. During the Windows 10 November Update in 2015, the IoT build lagged by about a month, though the earlier Anniversary Update arrived around the same time on both PCs and IoT devices. Cortana’s coming to your fridge. The impact on you at home: If I was in a betting mood I’d expect to see the new Windows IoT Core inspire multiple Cortana-powered smart speakers from third parties. Microsoft doesn’t appear to have any interest in making its own smart speaker. Instead the company is sticking to its standard the PC-is-the-solution-to-everything approach with Home Hub. That makes a certain amount of sense, however. As we’ve noted before Microsoft is backing away from hardware under CEO Satya Nadella save for the flagship Surface line. An army (or at least a platoon) of Cortana smart speakers would likely benefit Microsoft more than a single “Surface Echo” to take on Amazon and Google. To that end, Microsoft is bringing the features to Windows IoT Core that you’d need for a Cortana-powered speaker. In addition to Cortana itself, Microsoft is also adding far-field speech communication and wake-on-voice functionality to Windows 10 IoT and the PC version of the Creators Update. Far-field speech will enable Cortana to recognize voice commands from up to 13 feet away, and wake-on-voice allows users to activate a device with the “Hey Cortana” command. Microsoft hopes to see the first Cortana-powered IoT devices roll out in late 2017 around the back-to-school or holiday shopping seasons. If Microsoft and its device partners hit that target we could see Cortana-powered devices show up as early as Computex 2017 next May. This story, “Cortana’s coming to robots and smart devices via Windows 10 for the Internet of Things” was originally published by PCWorld.